All of Todd's novels are set just before or at the beginning of the "Third Pass", about 500 years after human settlement on Pern (500 AL, "After Landing") and 2000 years before the "Ninth Pass" events chronicled in most of Anne McCaffrey's Pern books. Dragonsblood features an epidemic that strikes fire-lizards, probably first, and dragons (reptiloids). The people of Pern have regressed since its settlement by colonists from Earth and have already lost the knowledge and equipment to handle such a bio-medical crisis. 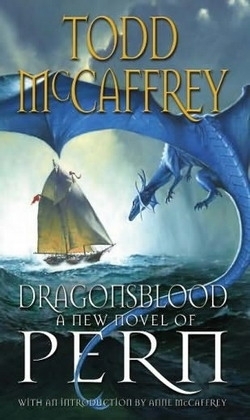 In Moreta: Dragonlady of Pern (1983) and Nerilka's Story (1985), Anne McCaffrey had featured a plague that decimates humans and apparently passes among mammals. That happened 1000 years later in Pern history.